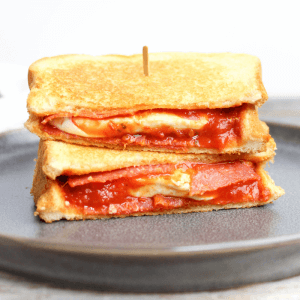 Pepperoni Pizza Grilled Cheese Sandwich is a delicious switch up from a classic grilled cheese sandwich made with pepperoni, Italian bread, pizza sauce and fresh mozzarella. I am bringing out my inner child a bit with this recipe. 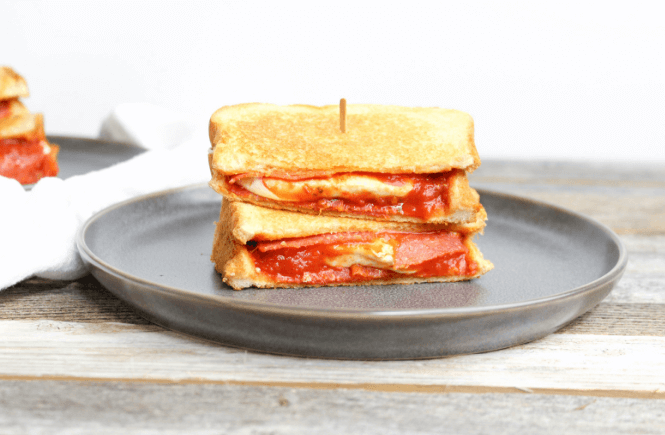 Pepperoni pizza and grilled cheese are two items I loved as a kid and foods that my both children eat without complaints! Okay, minimal complaints. The fusion of the two is really fun and completely delicious. The perfect grilled cheese starts with a properly heated pan. 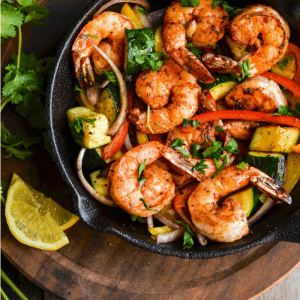 Make sure your pan is preheated on a medium heat before cooking. For that nice golden brown on the bread, let each side cook until you hear that sizzle stop. Once that sizzling stops, wait just a few seconds and then flip. 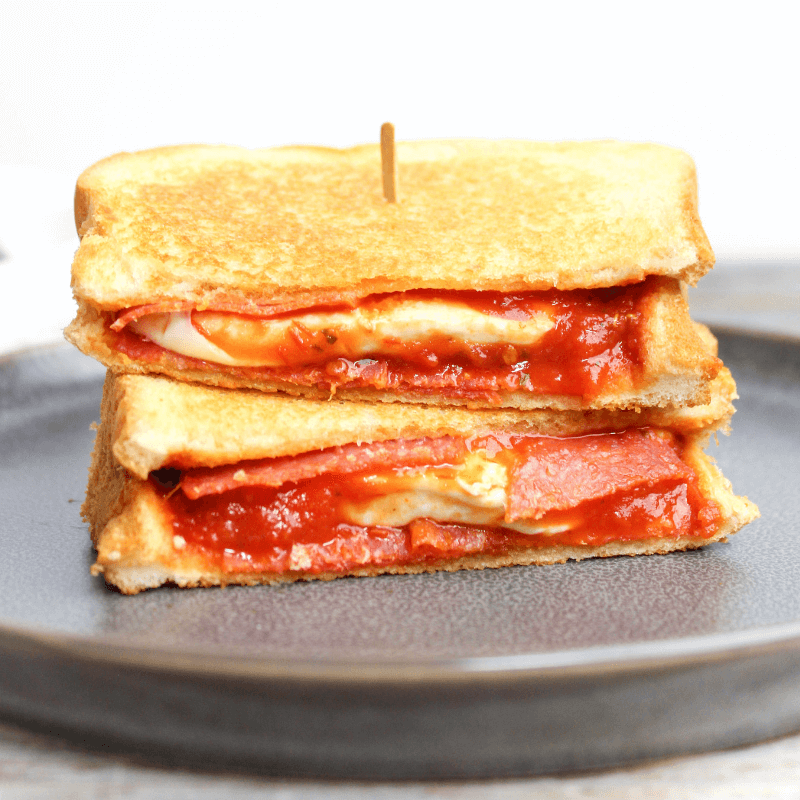 Pepperoni Pizza Grilled Cheese is a delicious switch up from a classic grilled cheese sandwich made with pepperoni, Italian bread, pizza sauce and fresh mozzarella. 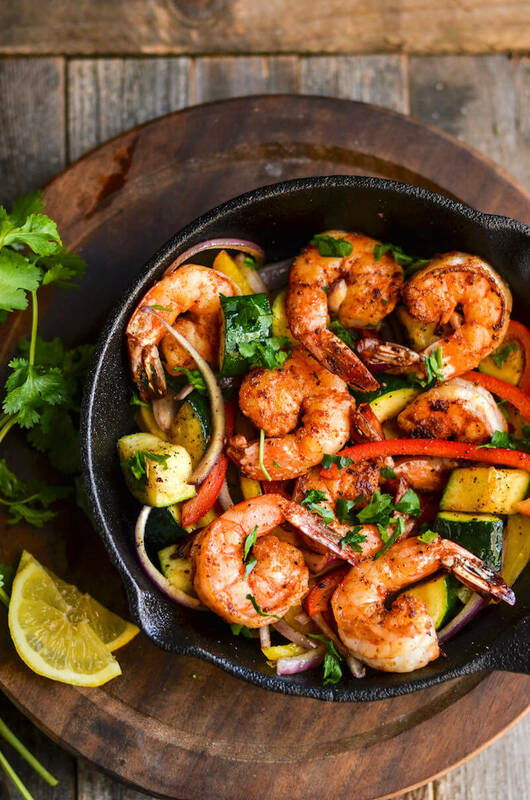 Place a non-stick pan on the stove top and preheat to a medium heat. Place a slice of bread onto pan butter side down. 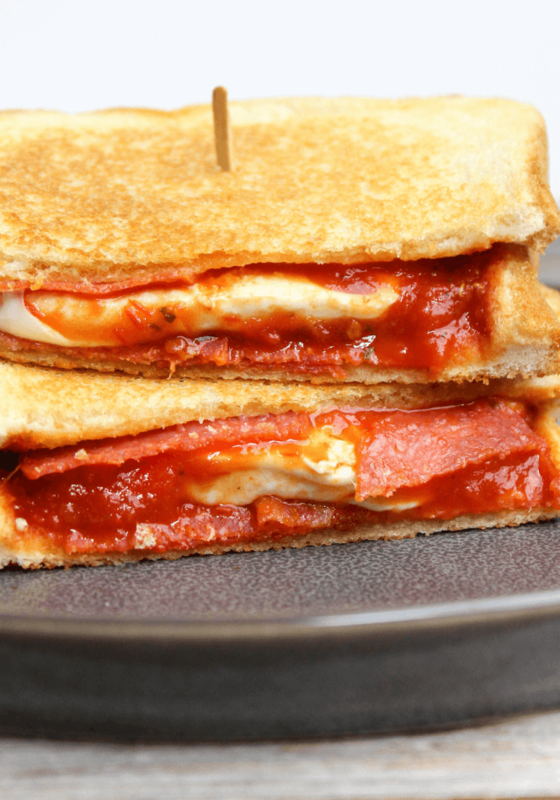 Add 6 slices pepperoni, 1 tablespoon pizza sauce, 2 ounces mozzarella cheese, 1 tablespoon pizza sauce, and 6 more slices of pepperoni - in that order. Place the other slice of bread on top with butter side up. 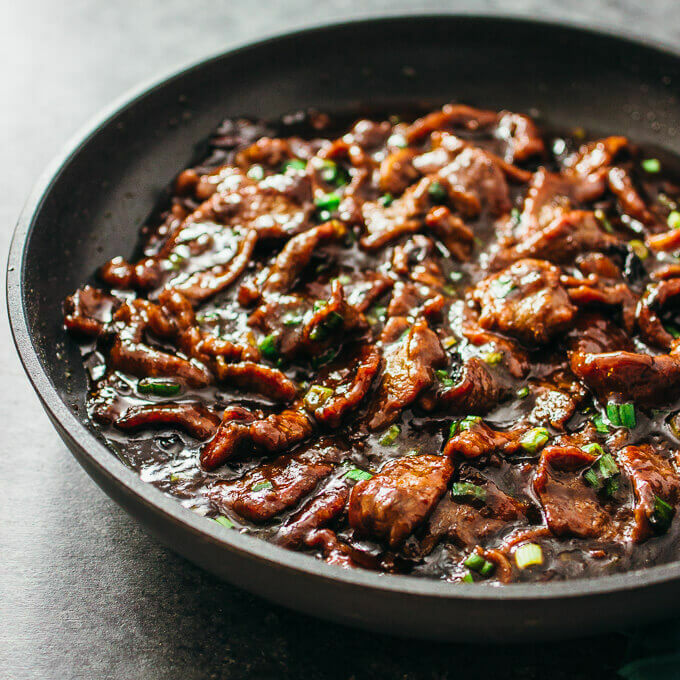 Cook until the sizzling stops (2-3 minutes) and then flip. Cook another 2-3 minutes. 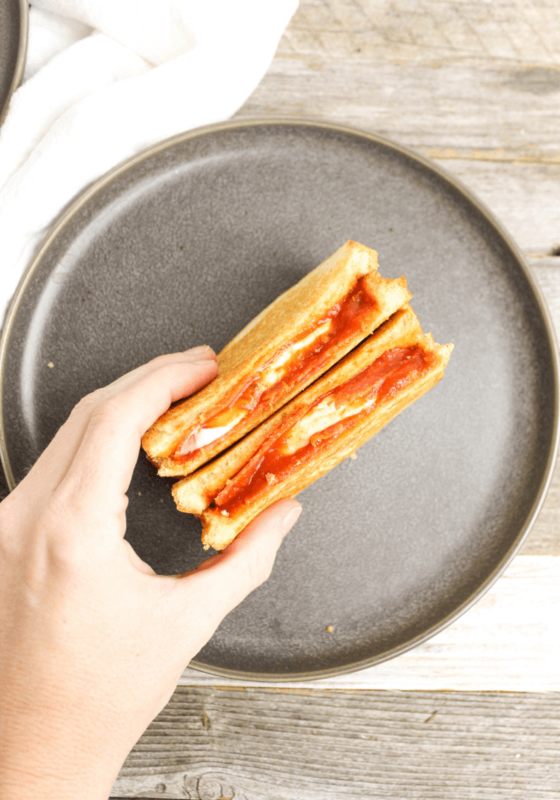 How do you eat your grilled cheese? 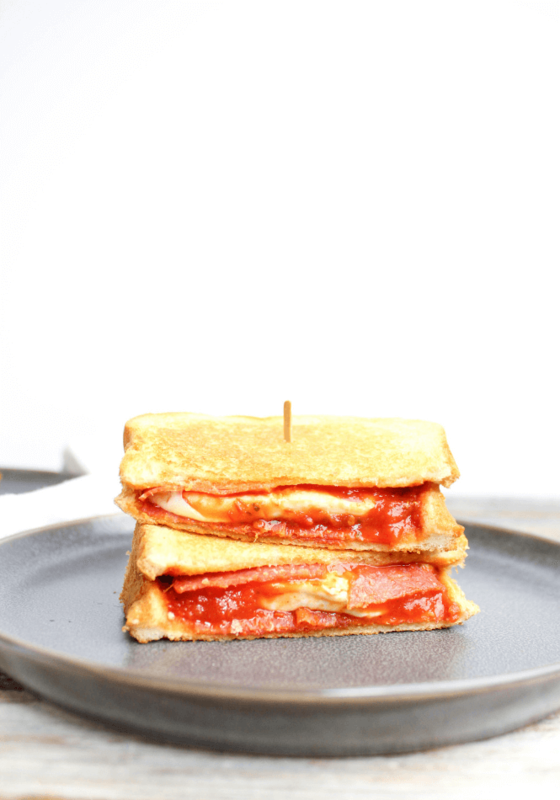 Do you dip it in tomato soup, make it extra cheesy? Let me know in the comments below. 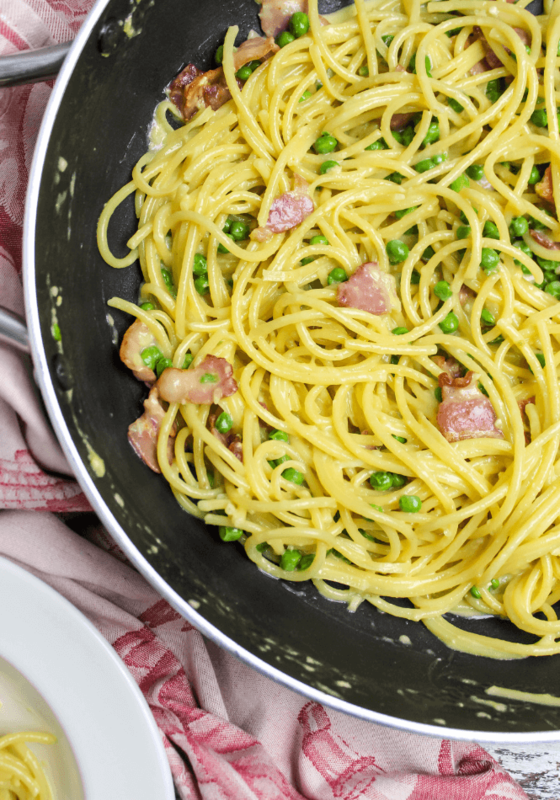 Carbonara with Peas is a creamy pasta dish made with thick pieces of bacon, garlic, Parmesan cheese, egg and Barilla® Collezione Bucatini for a simple, yet elevated, weeknight meal. 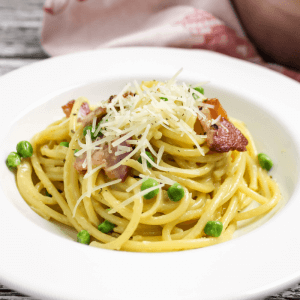 Carbonara with Peas is a gourmet meal that isn’t too complex and requires just a few ingredients making it the perfect dish for busy nights or for a cook that is just dipping their toes into creating more artisanal foods at home. For myself, creating artisanal meals starts with family tradition. 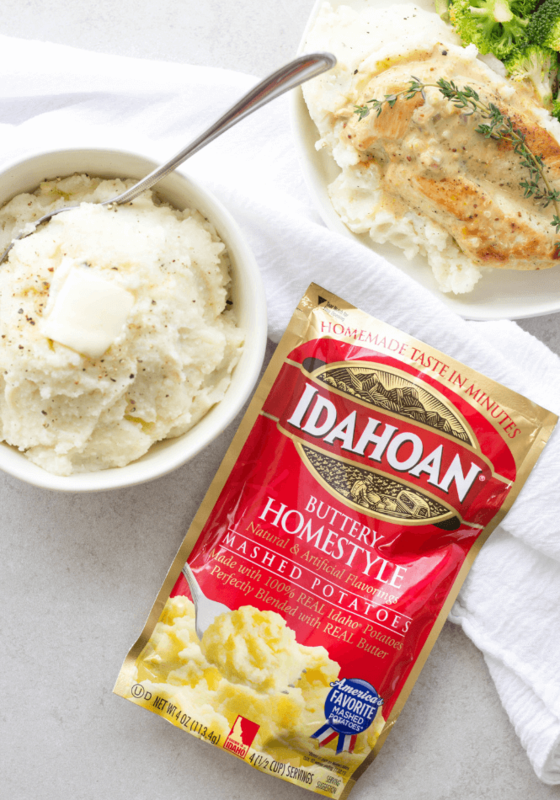 The best traditional meals are the ones that supply comfort in every bite and have the power to bring families together around the dinner table. A carbonara is THAT meal for my family. 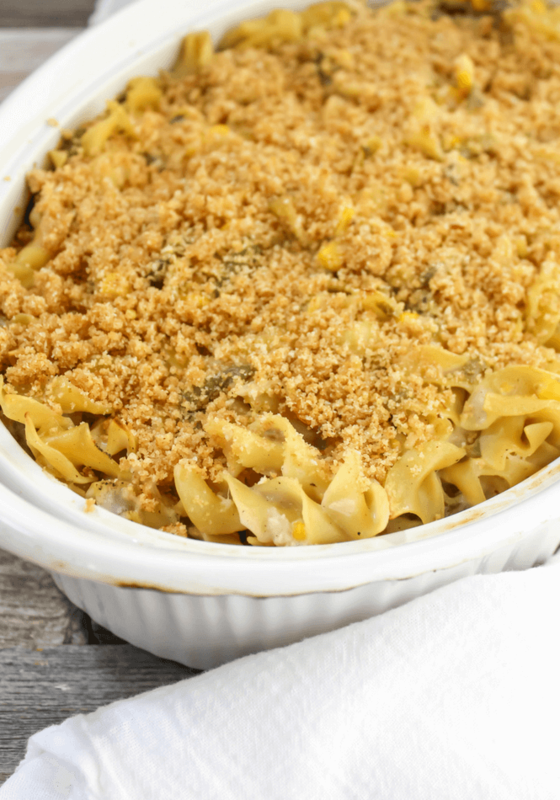 Barilla® is my go-to pasta to create all kinds of delicious meals for my family from spaghetti and meatballs to tuna casserole. 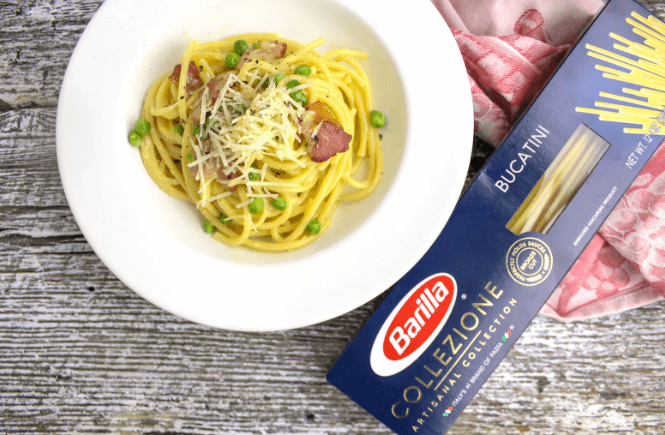 When I want to create a more gourmet pasta dish, I reach for Barilla® Collezione. 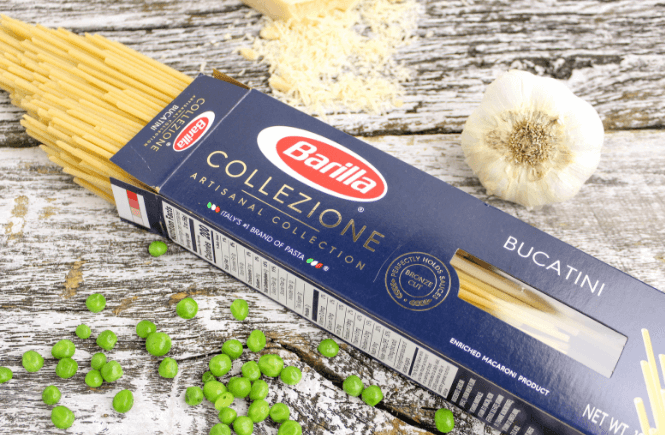 Barilla® Collezione is made with non-GMO ingredients and crafted using traditional Italian bronze plates for a homemade texture. 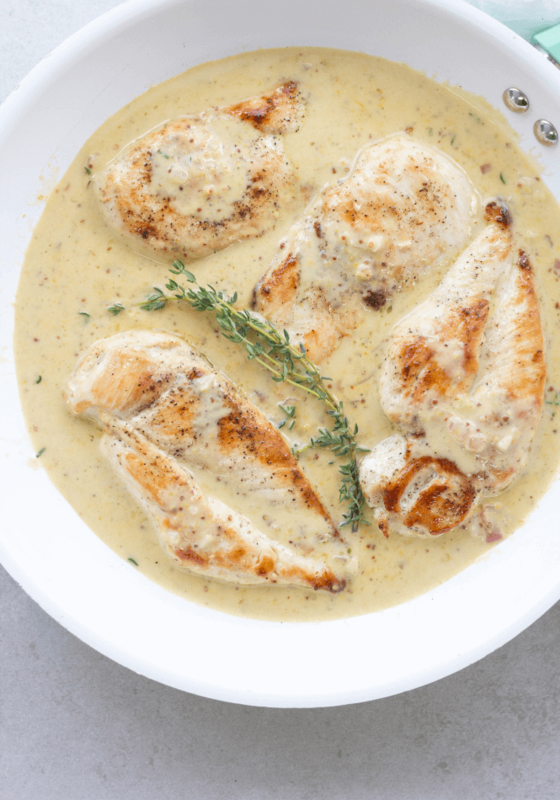 The bronze cut taste and texture perfectly holds sauce and you can really taste the Collezione difference. 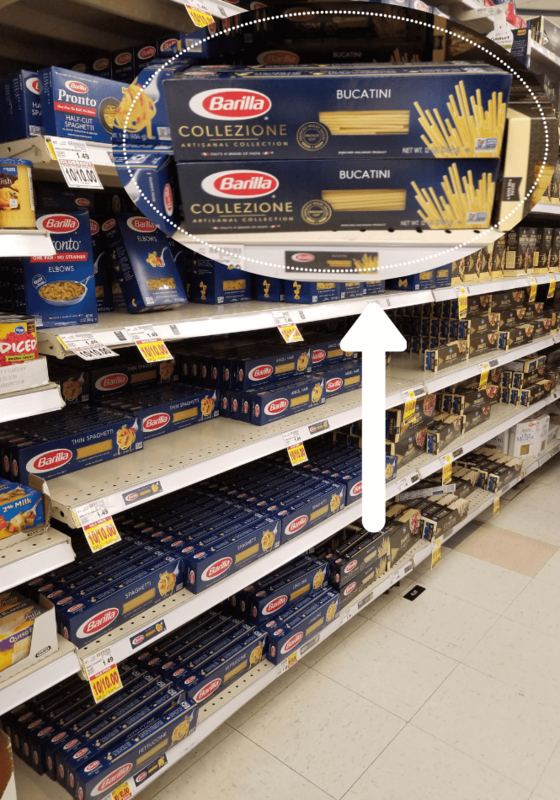 You can find Barilla® Collezione pasta shapes at your local grocer. I found mine on the pasta aisle at Kroger on my weekly shopping trip while picking up my other Carbonara with Peas ingredients. 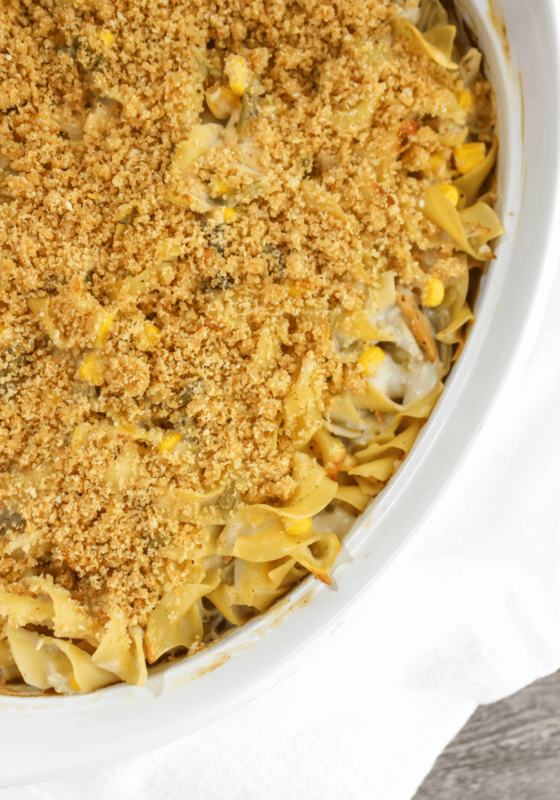 Click HERE to visit Saving Star to save on Barilla® ! Bring on the pasta! 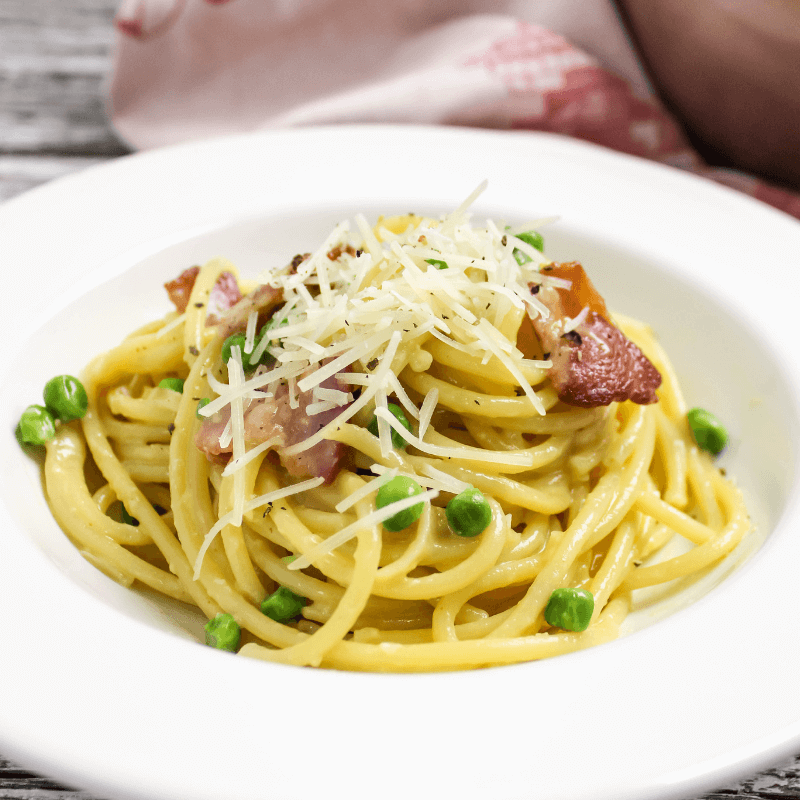 Carbonara with Peas is perfect when you want to put a great meal on the table quickly. Not many gourmet dishes have a 7 minute cook time and limited prep work needed like this carbonara. 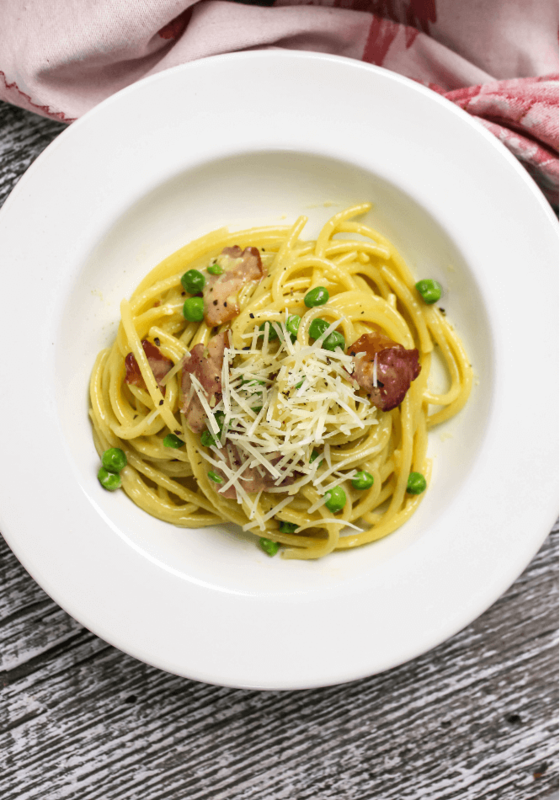 The rich, silky texture of this pasta dish with the garlicky peas and hint of bacon all over is going to put this recipe in your dinner line-up over and over again. I feel that some people are intimidated by the egg in carbonara but don’t be. 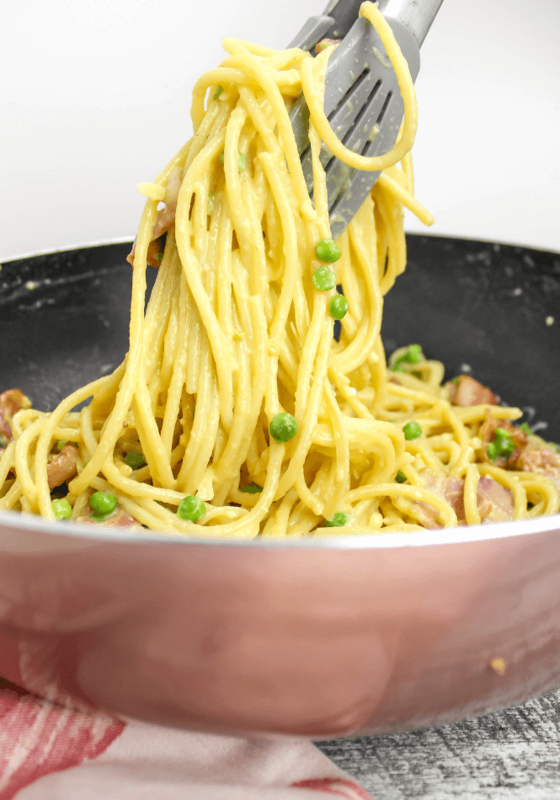 The trick to carbonara is to finish cooking the pasta and pan of bacon with peas at the exact same time so you can quickly drain the pasta and add all ingredients together while everything is hot. The hot ingredients is what cooks that raw egg well enough to consume. Make sure the eggs are pasteurized and fresh. 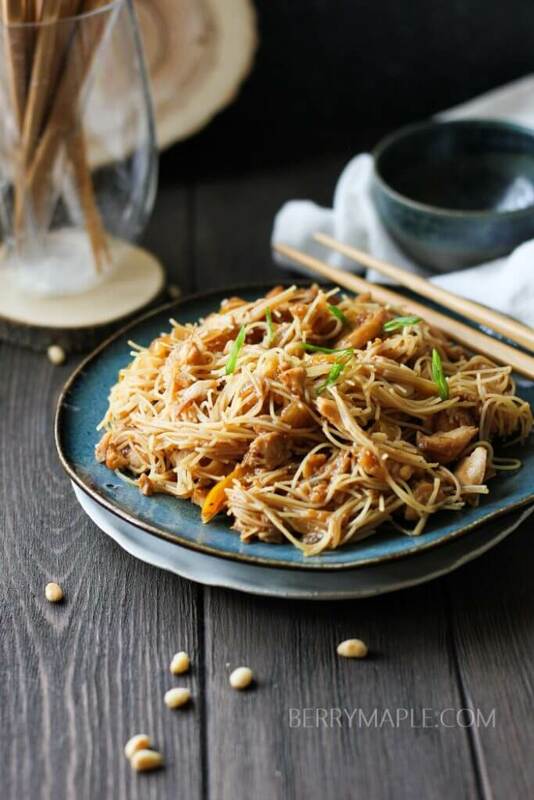 After the first bite, your taste buds and tummy will be thanking you for making this dish! 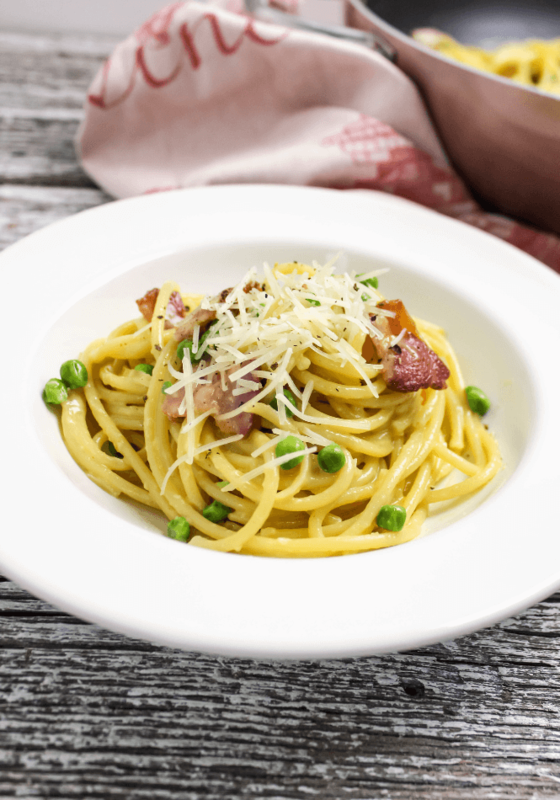 Carbonara with Peas is a creamy dish made with thick bacon pieces, garlic, Parmesan cheese, egg and Barilla® Collezione Bucatini for a simple, yet elevated, weeknight meal. Chop bacon into 1 inch slices. In a small bowl, mix 4 eggs and 1 cup shredded parmesan cheese together. Bring 4-6 quarts of water to a boil. Add salt and pasta. Boil pasta for 7 minutes. Timing is important with Carbonara so right when you put the pasta in to cook, add the bacon into a large preheated saute pan on the stove top. Cook the bacon for 5 minutes. Add the peas to the bacon for 1 minute. Push the bacon and peas to the side while you add the garlic. Let the garlic cook until it is aromatic (about 1 minute). Mix the garlic with the peas and bacon. Immediately drain the pasta as it finishes it 7 minute cook time reserving half a cup of the pasta water for later. 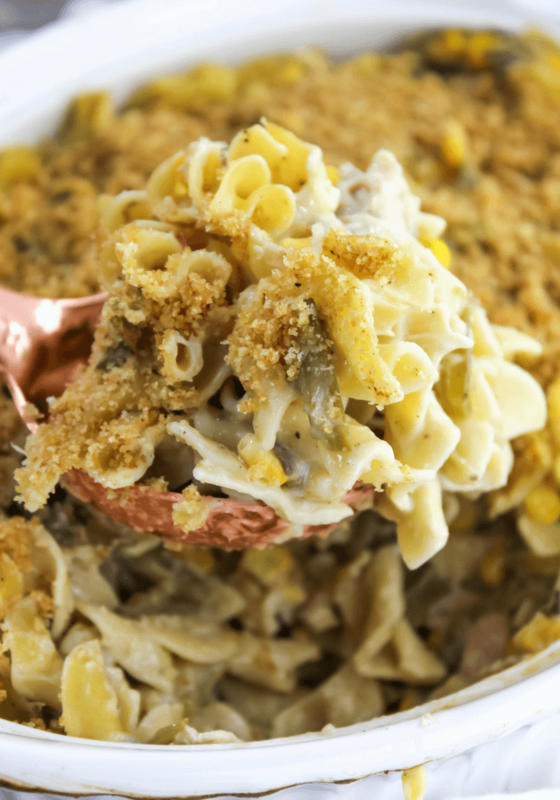 Place the drained pasta into the bacon pan and stir ingredients together for 1 minute. Remove the pan from heat and add the egg mixture. Stir well and quickly. Add in the reserved pasta water as needed until you get a creamy consistency. 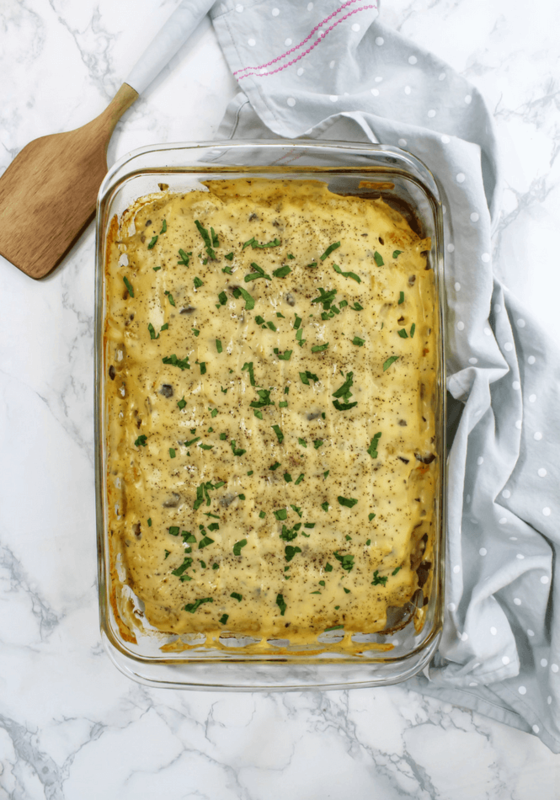 Serve with some fresh ground pepper and parmesan cheese on top. 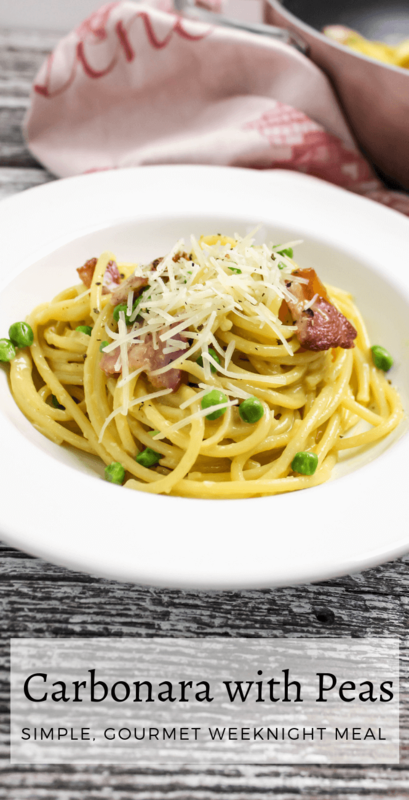 Have you ever made a carbonara at home? 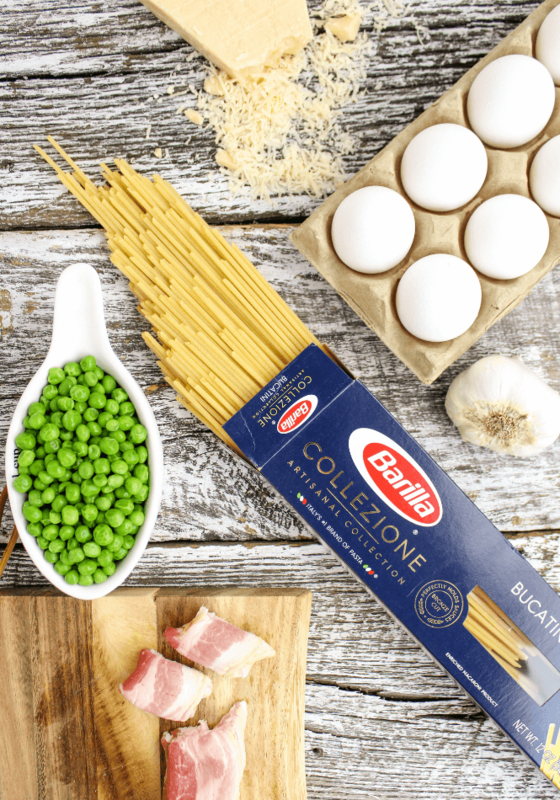 Let me know in the comments below and tell me how you elevate everyday dishes using Barilla® Collezione! ** This recipe may contain raw egg. I recommend pasteurized eggs to reduce risk of food-born illness. 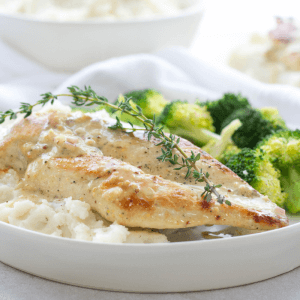 Pan Seared Salmon is my go-to for throwing together a quick weeknight meal that is both healthy and delicious. 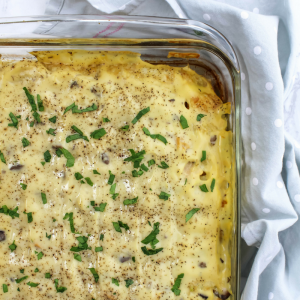 Pair with some rice and oven Roasted Green Beans for a full family meal that is on the table in 20 minutes. 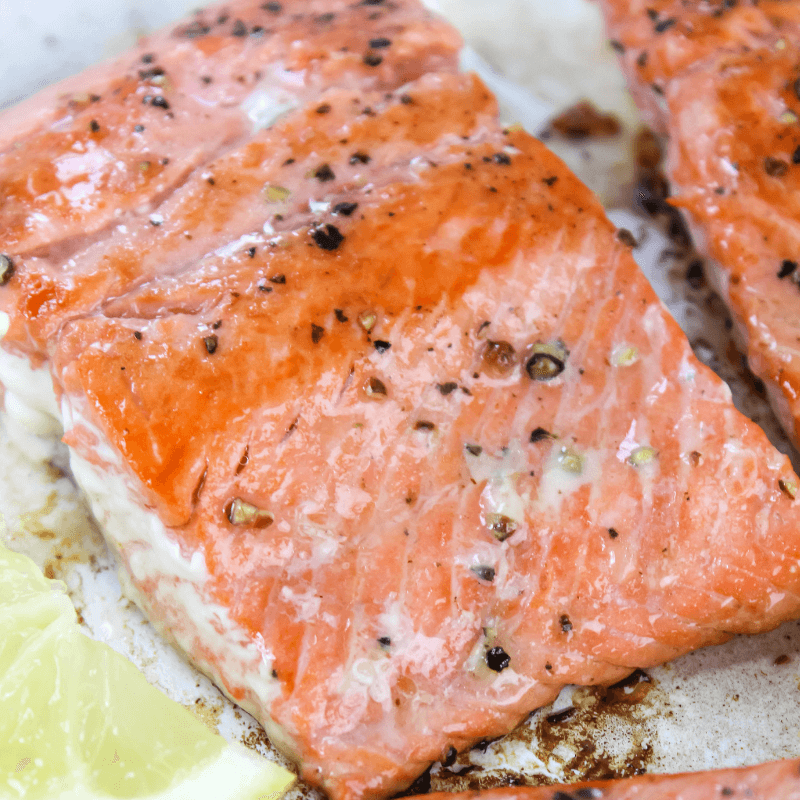 Salmon is one of those foods that just makes you feel good eating. 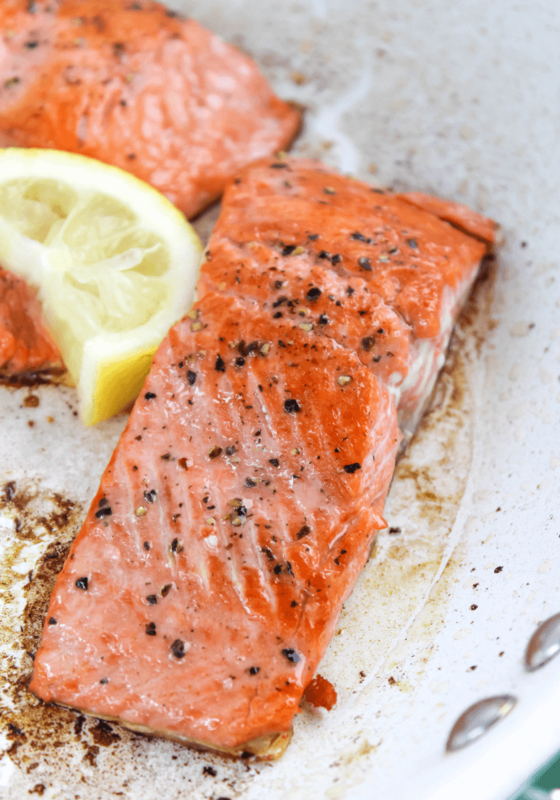 With all the health benefits associated with salmon, it’s no wonder why. Rich in Omega 3 fatty acids. Omega 3 fatty acids have a wide range of health benefits from managing heart disease and lowering blood pressure just to start. Salmon is rich in protein. 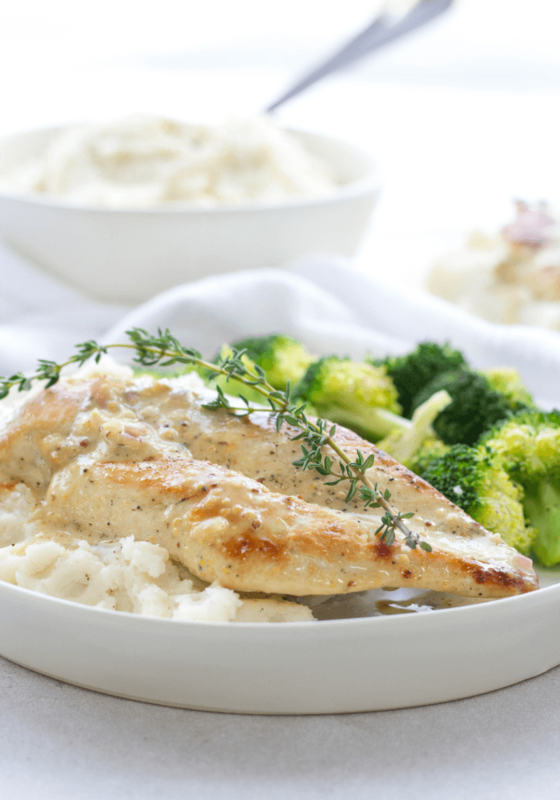 High in the B vitamins which play a role in your body from head to toe. Contains the antioxidant, Astaxanthin, which benefits the heart, brain and skin. 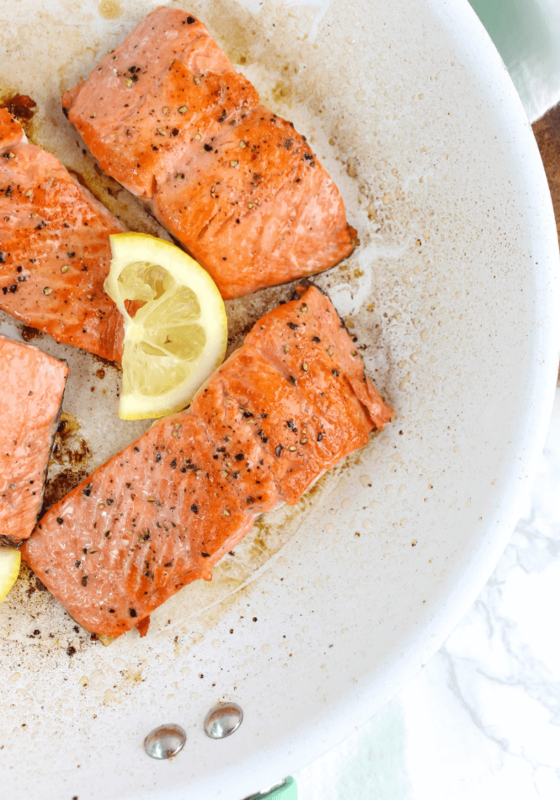 Today, I am just sharing how I pan sear salmon with some olive oil, salt, pepper and a squeeze of lemon. 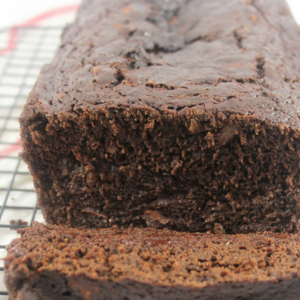 You can take this basic recipe and create all kinds of different flavors from it. 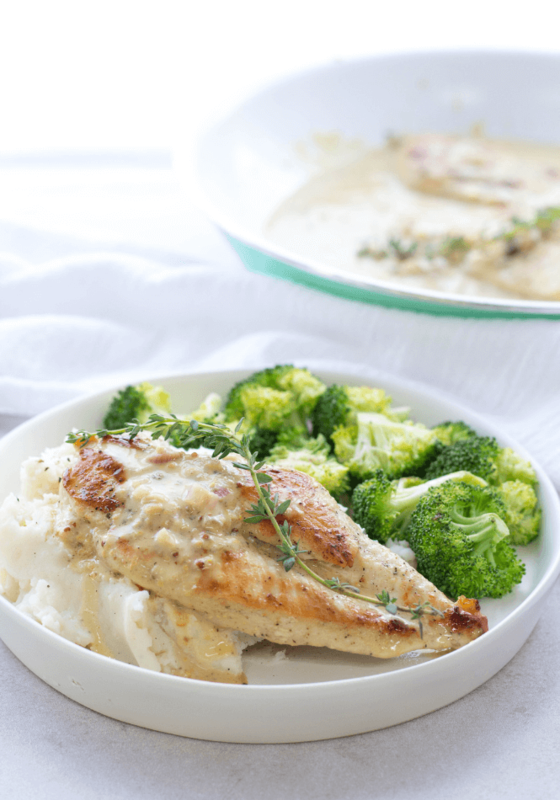 Make a creamy sauce, add herbs or honey or brown sugar. There are so many possibilities. Let me know what your favorite flavor combinations are in the comments below. Also check out Lemon Garlic Salmon for a recipe to bake in the oven. Preheat a large non -stick pan on the stove top on a medium heat. 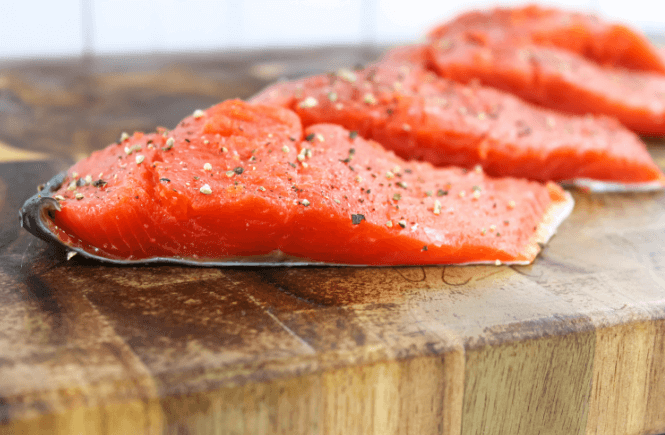 Cut your salmon into 4 even portions. Leave skin on and remove any bones. Salt and pepper each side. 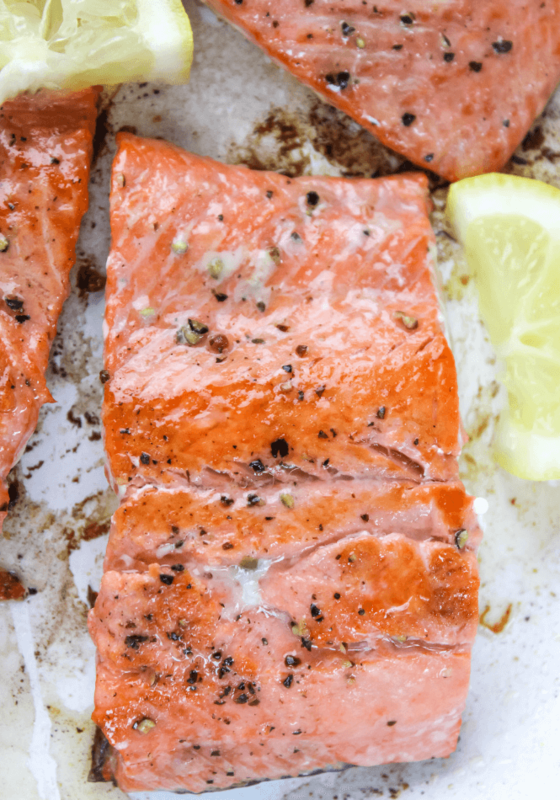 Once the pan is hot, drizzle a tablespoon of olive oil in pan followed by your salmon placing it skin side up. Cook for 3 minutes. Flip the salmon and cook another 4 minutes. Squeeze a lemon wedge over each portion. Serve. The skin will still be on the salmon, you can easily remove it before serving or serve with skin on. 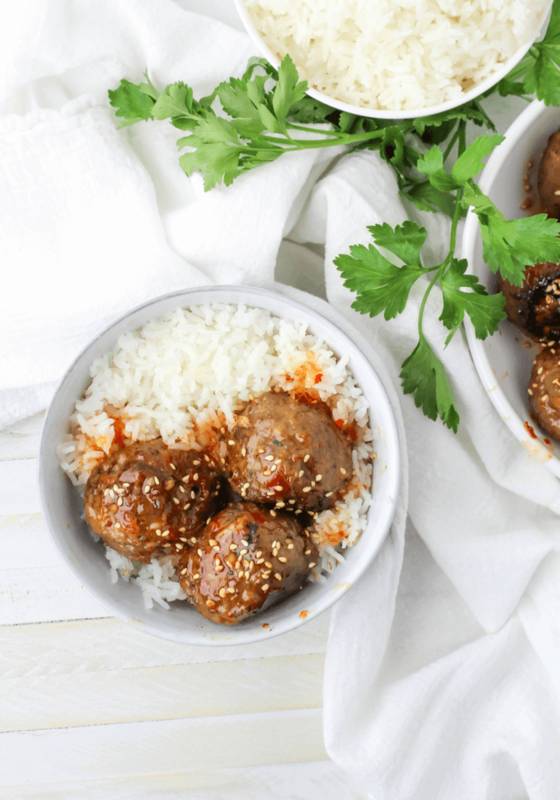 Asian Meatballs are a fun switch up from a classic meatball with loads of flavor from ginger, herbs and sweet chili sauce. 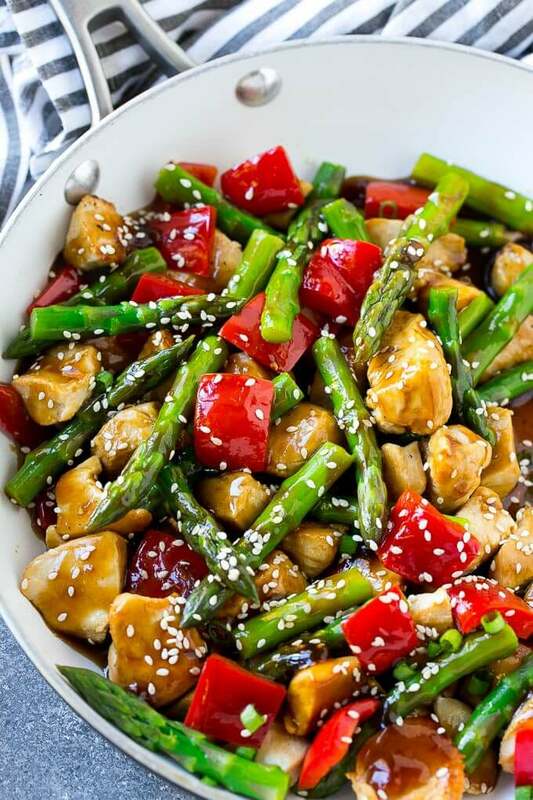 Serve over rice and top with sesame seeds for a delicious dinner the whole family is going to enjoy. We love making meatballs around here- maybe I love them because it is one of the few things my husband will voluntarily cook for everyone. 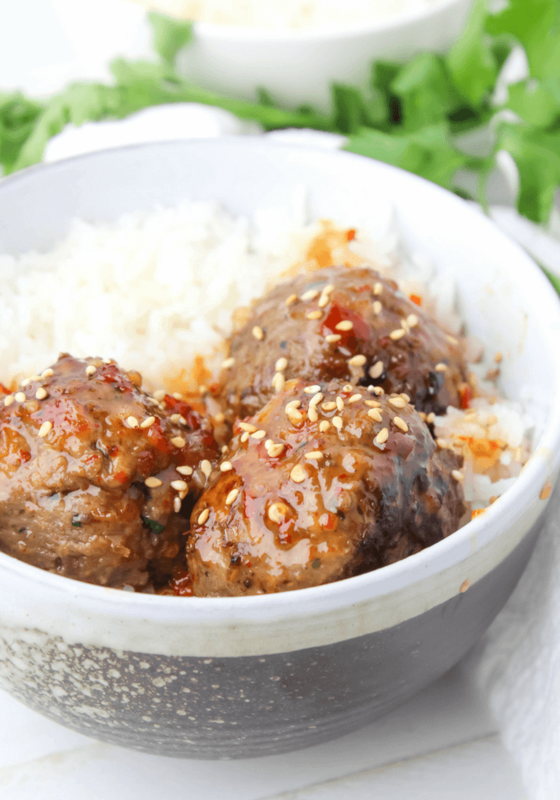 A day off cooking is nice from time to time but seriously, these meatballs are delicious. 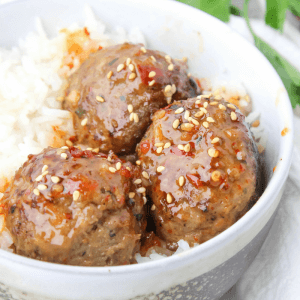 These Asian Meatballs have a base of a basic meatball with the breadcrumbs and egg but the flavor really pulls through with the extras like fresh herb and sweet chili sauce actually mixed in. 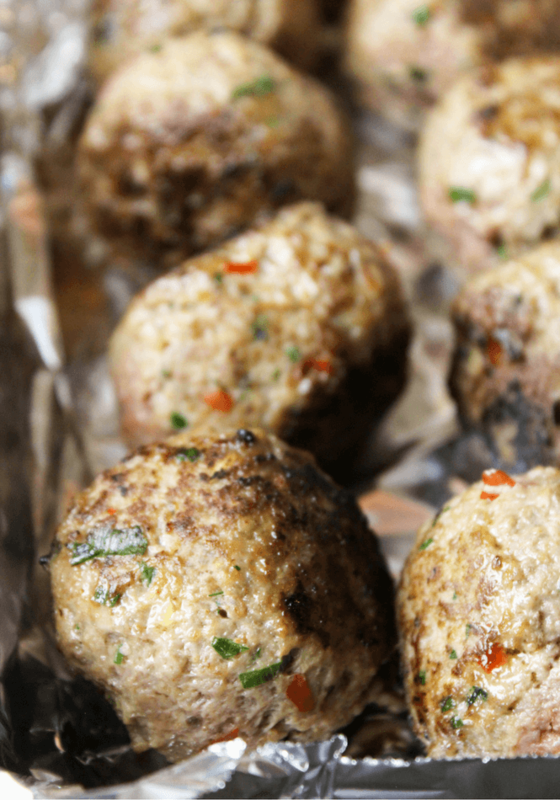 Let the ground beef sit out for 30 minutes before forming meatballs. 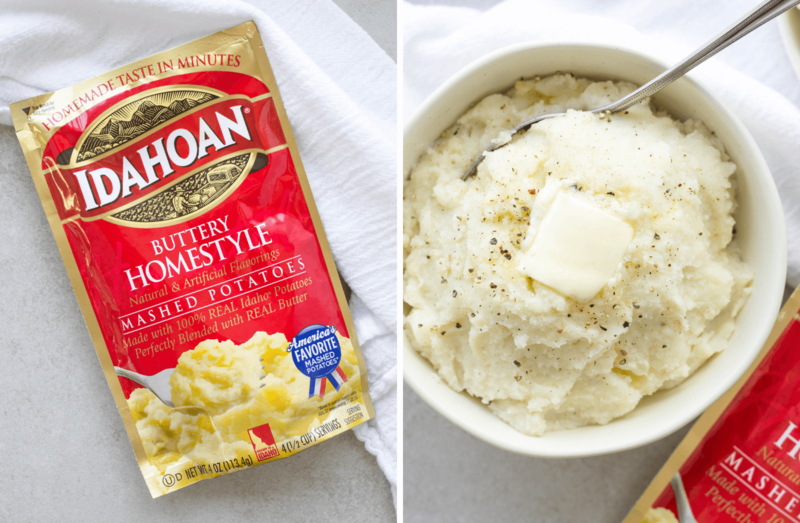 Use gloves to really get in there and mash all the ingredients together. A meatball press/baller does wonders to rolling the meatballs. 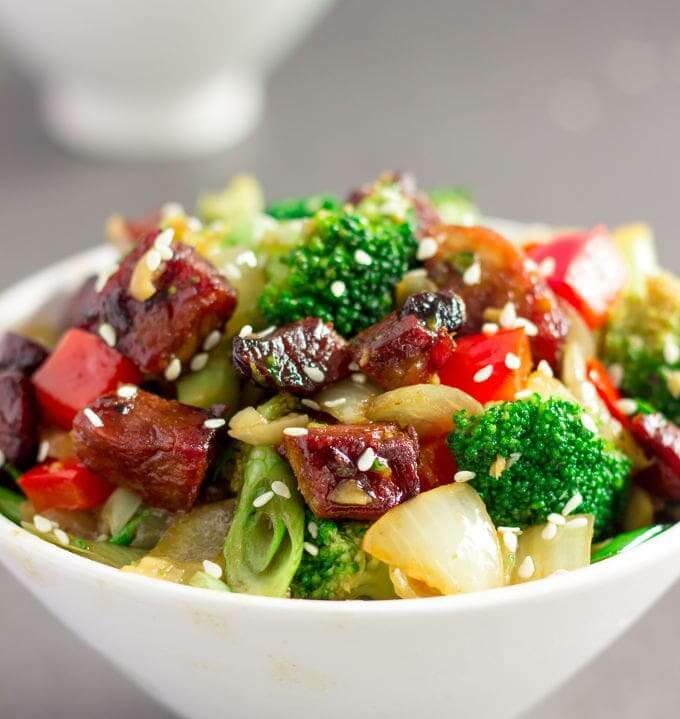 Use fresh ingredients- fresh ginger root, green onion, parsley. Brown the meatballs before baking. 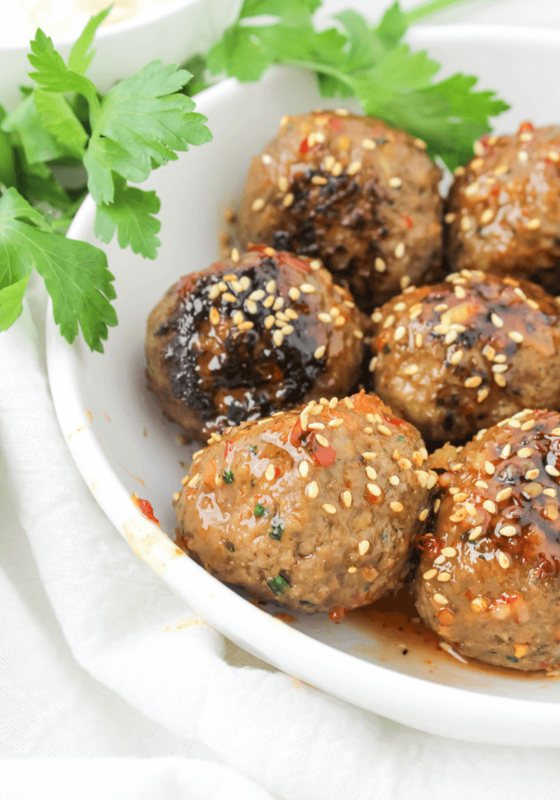 Let the ground beef sit out at room temperature for 20 minutes before making meatballs. In a medium mixing bowl, add the ground beef, bread crumbs, egg, chopped parsley, chopped green onion, minced ginger, salt and 1/4 cup of the sweet chili sauce. Put gloves on and mix the ingredients together well. Form the meatballs. I recommend a meatball press/baller to get them equally formed. 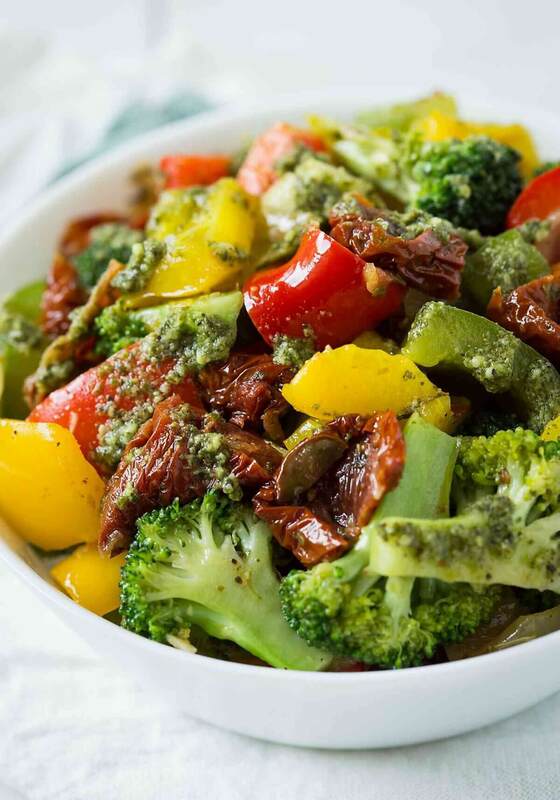 Heat up a pan on a medium-high heat on stove top and preheat oven to 375 degrees. 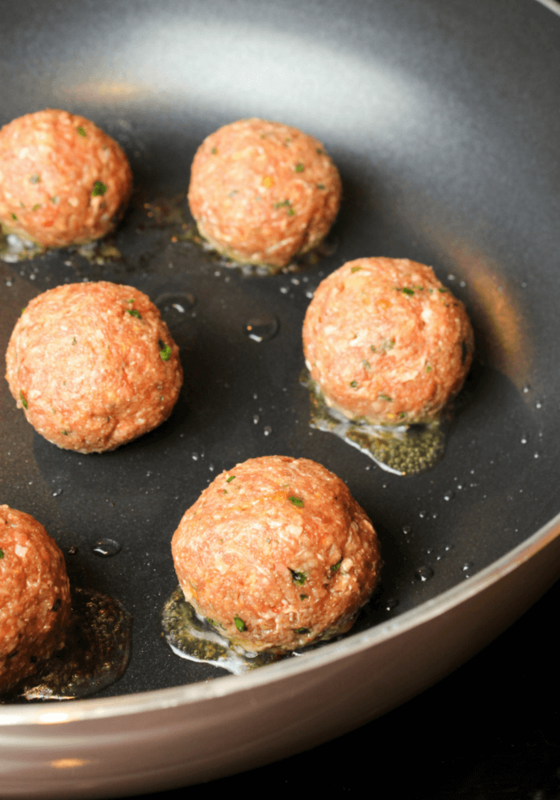 Add a tablespoon or so of olive oil, followed by the meatballs. Let all 4 sides of the meatball brown and then place into a foil covered baking sheet or casserole dish. Flip meatballs and pour the remainder of sweet chili sauce on top. Bake another 10 minutes. 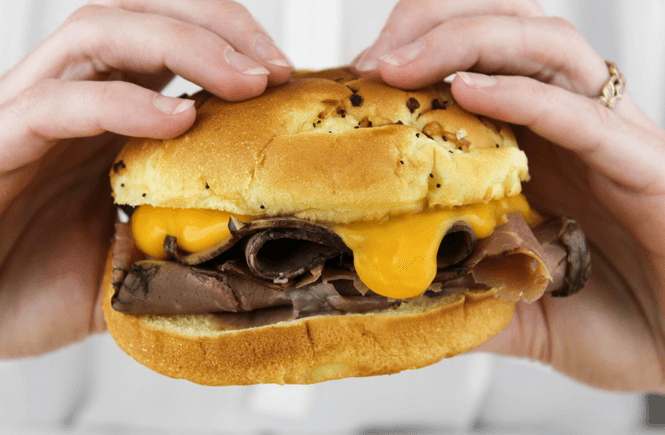 Roast Beef and Cheddar Sandwiches are made with deli roast beef, a tangy horseradish sauce, soft onion poppyseed hamburger buns and a dollop of Ricos Premium Cheddar Cheese Sauce for a quick family dinner fit for any night of the week. Summer vacation has officially started and those warm weather activities are consuming our lives. From the pool to the zoo to festivals and vacations – we are one busy family this time of year! 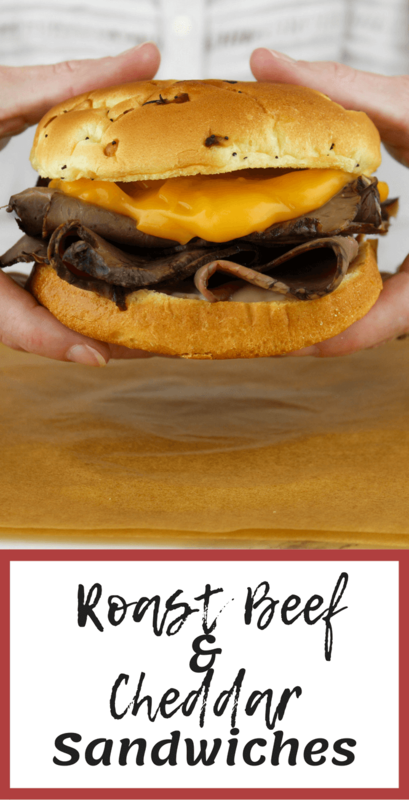 These Roast Beef and Cheddar Sandwiches are perfect for all those crazy days when spending an hour over a hot stove just isn’t part of the game plan. 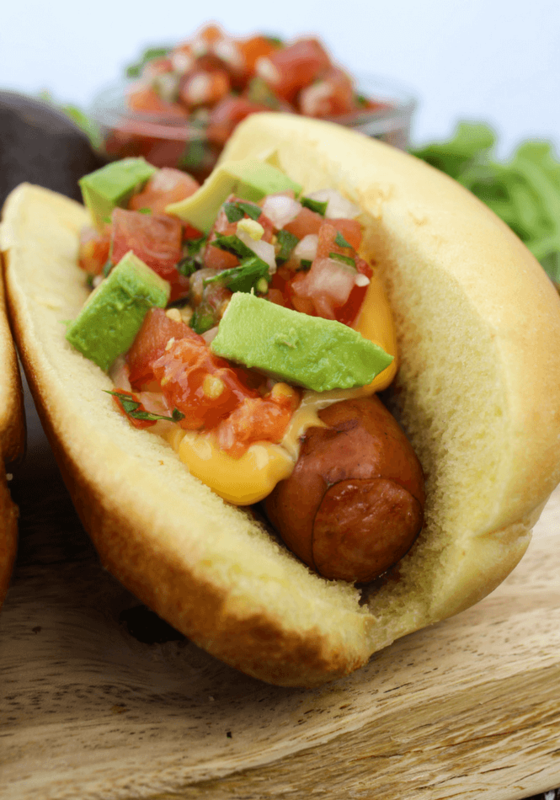 Plus, these sandwiches are made with only 4 ingredients to make dinner easy-peasy, nacho cheesy! My local Walmart is the go-to for stocking up on my favorite Ricos Cheese Sauces to save time and money. 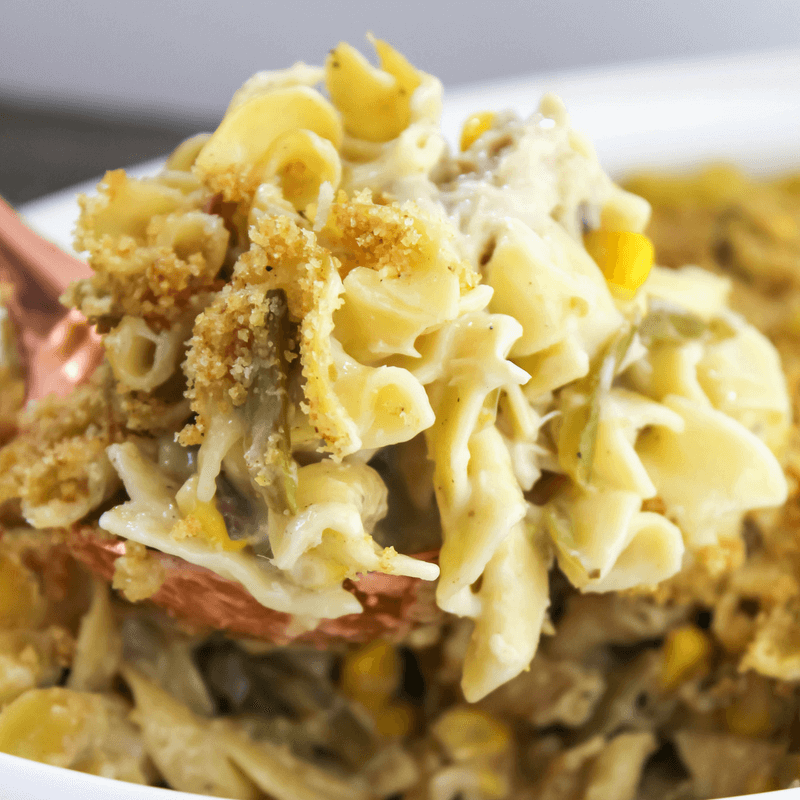 Try the Ricos Condensed Cheddar Cheese Sauce with 50% more product when mixed correctly! 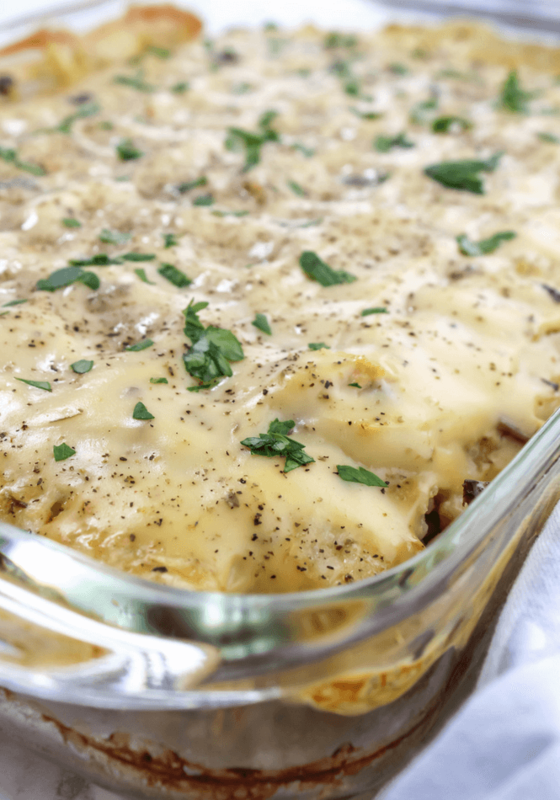 From nachos or cheesy bean dips to family dinners, Ricos has a cheese sauce for everything! 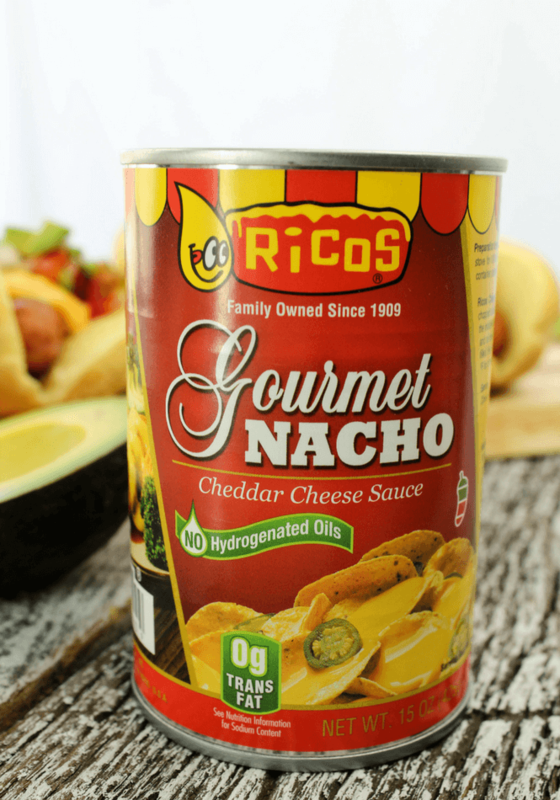 All Ricos Cheese Sauces are trans fat free with no hydrogenated oils and super easy with heat and serve instructions perfect for hosting parties, barbeques and holidays. 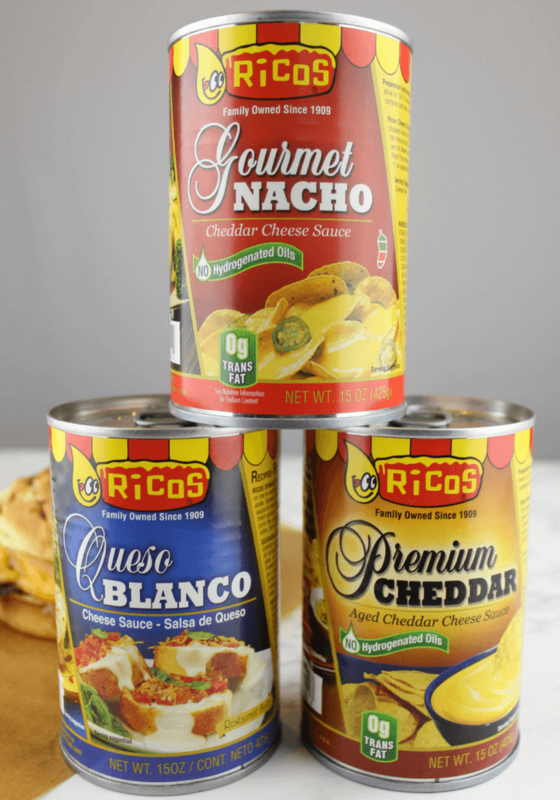 Click HERE to see the whole Ricos Cheese Sauce line-up! 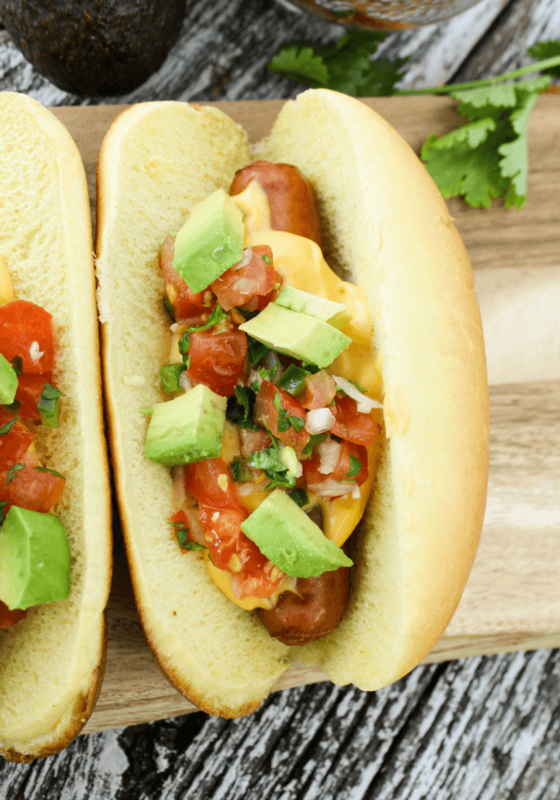 Queso Smothered Chicken Burritos – These delicious burritos aren’t just for Cinco de Mayo! 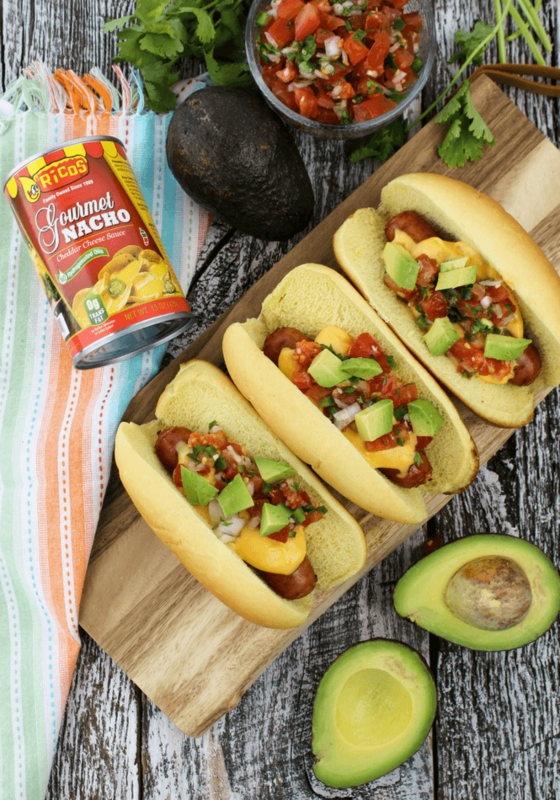 Great for hosting parties or just an amped up family taco night. 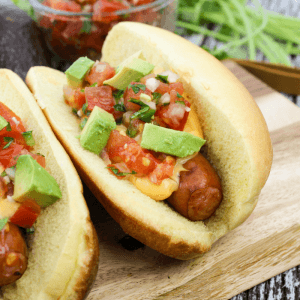 Mexican Hot Dogs with Nacho Cheese – It’s grilling season after all and hot dogs are a summer go-to! Cheesy Taco Pasta – Pasta with Ricos Cheese Sauce and all your favorite taco fixings is in the running to become one your families favorites. 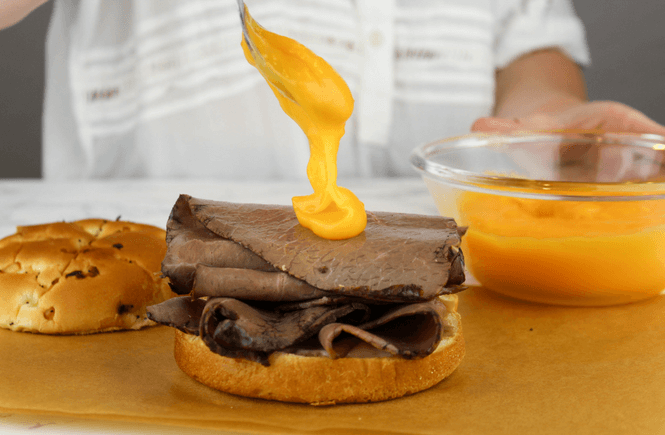 Just four ingredients and less than 20 minutes needed to heat up these Roast Beef and Cheddar Sandwiches! Start by preheating the oven to 400 degrees and pack the roast beef deli slices inside some foil. The meat will heat up quickest if you use two foil packs and separate the roast beef. Place the foil packs of deli meat in the oven for 15 minutes. 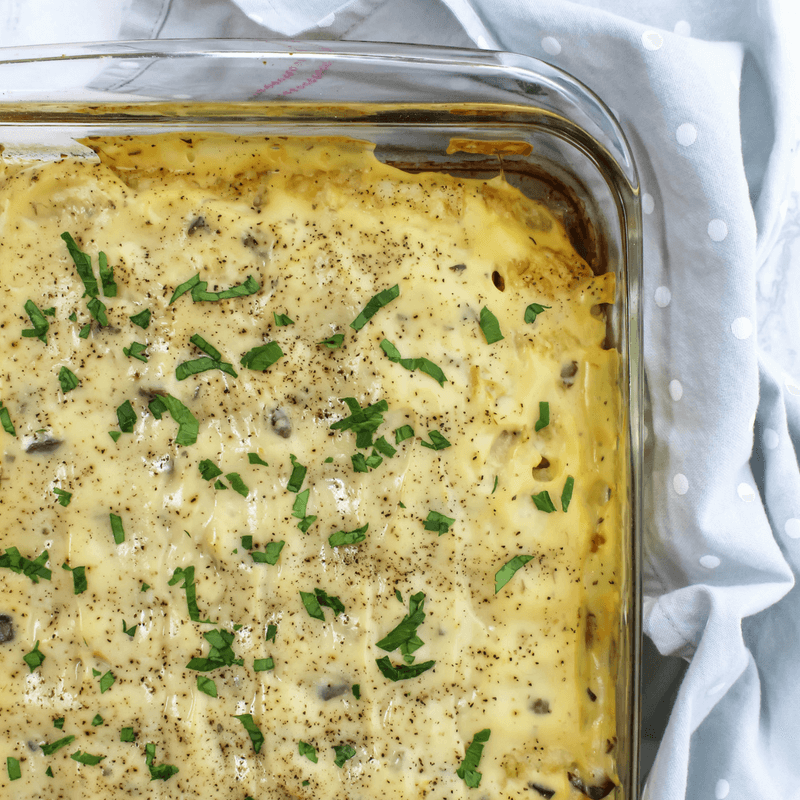 As the roast beef is waring up in the oven, heat your Ricos Premium Cheddar Cheese Sauce on the stovetop in a saucepan on a low-medium heat for 10 minutes stirring often. Time to assemble. 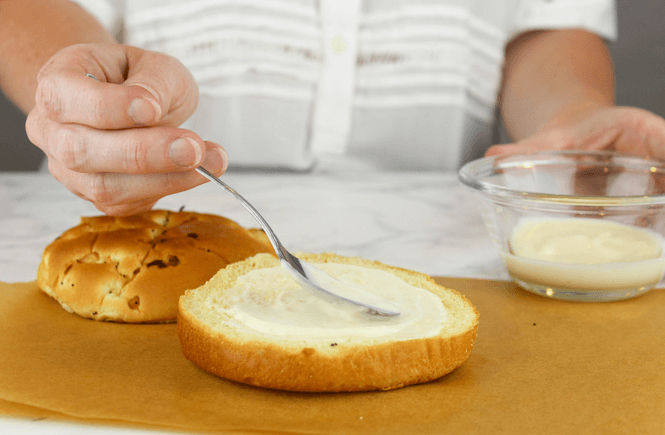 Spread about a teaspoon of horseradish sauce on the bottom bun of each sandwich. 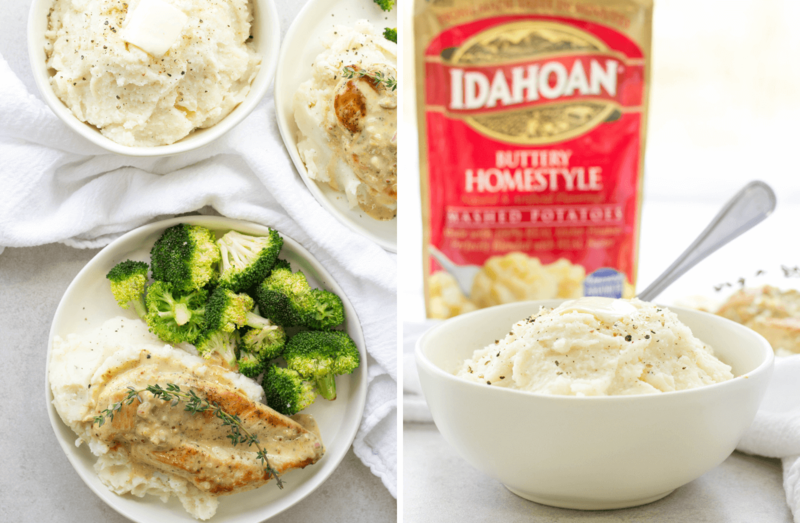 Horseradish goes a long way to just a little is all you need for a lot of extra flavor! One of my children doesn’t like horseradish sauce so you can even opt out of the sauce and still make a delicious sandwich. 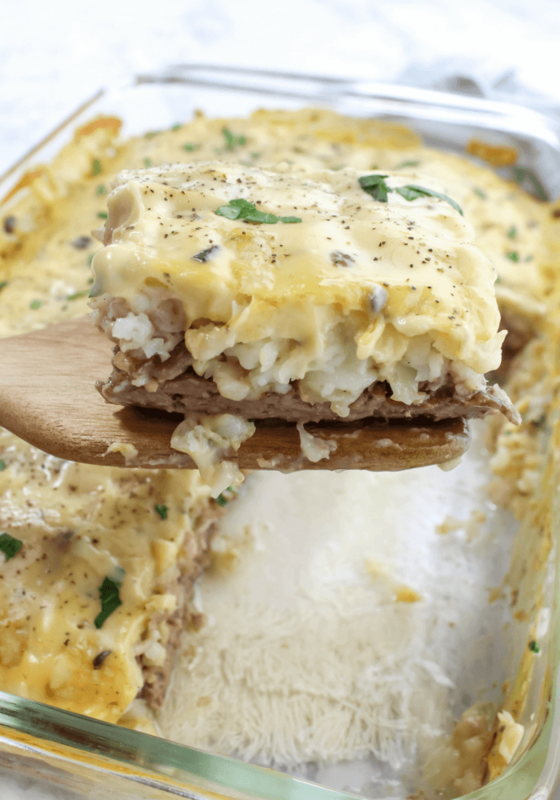 Place about four slices of the warmed up roast beef on top. Now, time for the good stuff! 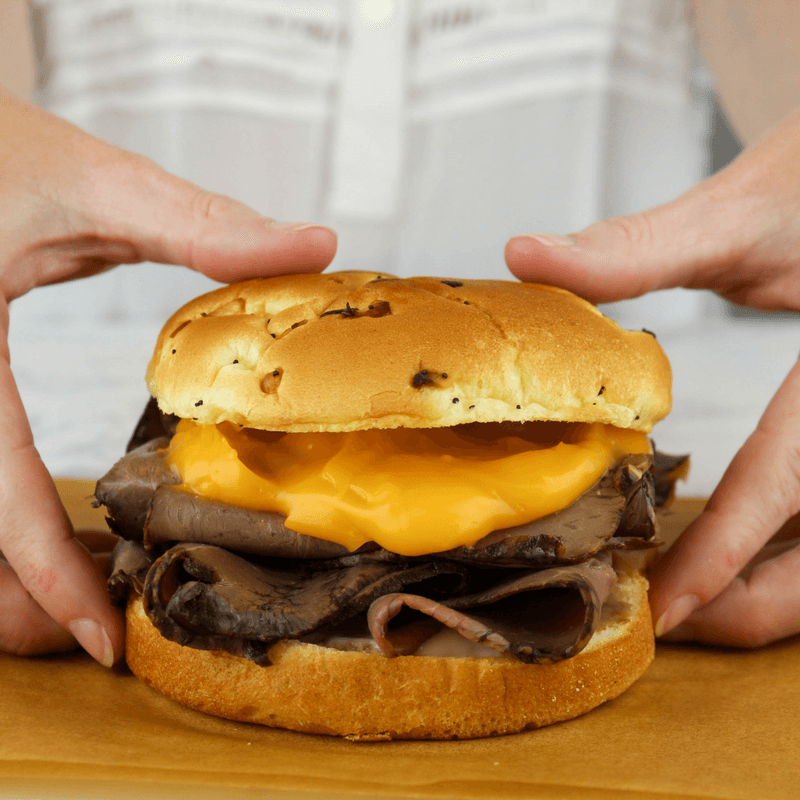 Place a couple tablespoons of Ricos Premium Cheddar Cheese Sauce on top of the roast beef layers and place the top of the bun in place. Serve immediately and enjoy. 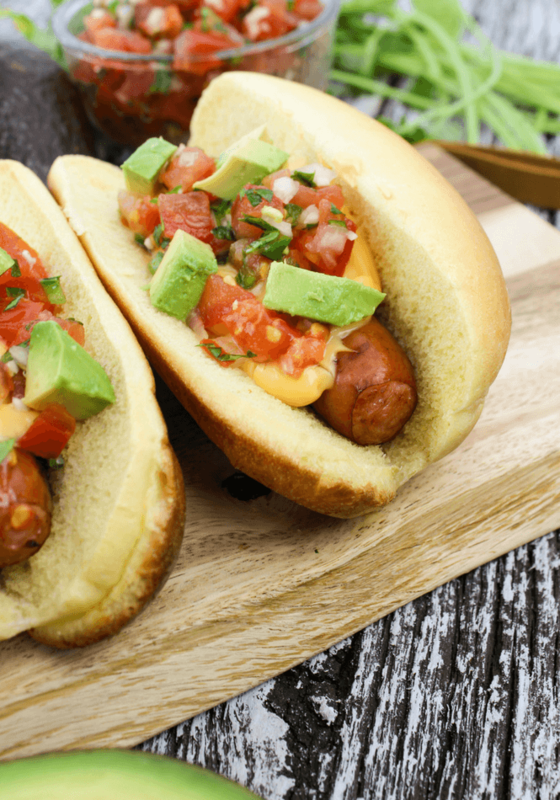 Don’t have time for the oven and stovetop or maybe you just don’t want to heat up your home even more on a hot summer day? I don’t blame you! You can just heat up the Ricos Premium Cheddar Cheese Sauce in the microwave for 2 minutes in a microwavable safe container with lid, stirring halfway through cook time. Then, heat the deli meat in the microwave. To heat deli meat in the microwave, spread the meat out on a plate with a paper towel over top and cook for 1 minute. Check after one minute, you may need to flip the meat and microwave another 30 seconds to thoroughly heat. 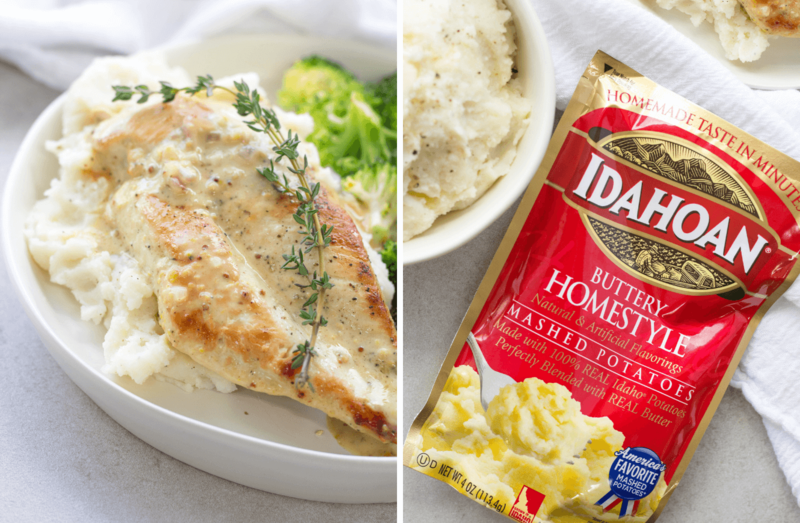 Dinner does not get any easier than this! 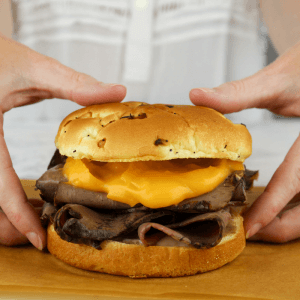 Roast Beef and Cheddar Sandwiches are made with deli roast beef, a tangy horseradish sauce, soft onion poppy seed hamburger buns and a dollop of Ricos Premium Cheddar Cheese Sauce for a quick family dinner fit for any night of the week. Find microwavable directions within post above! 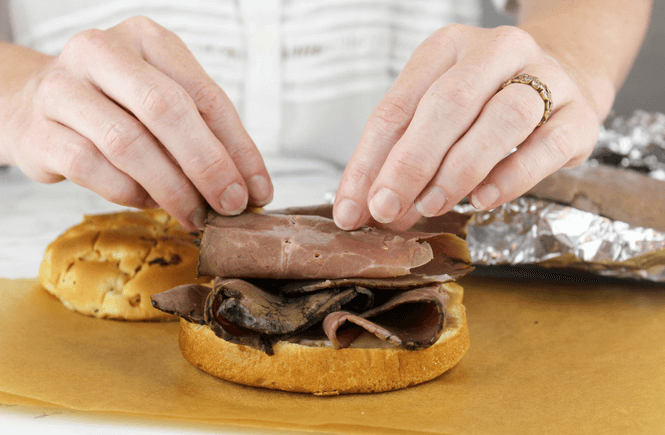 Wrap the roast beef deli slices in foil. Using two foil packs will heat the meat up quickest. Place the deli meat in oven for 15 minutes. 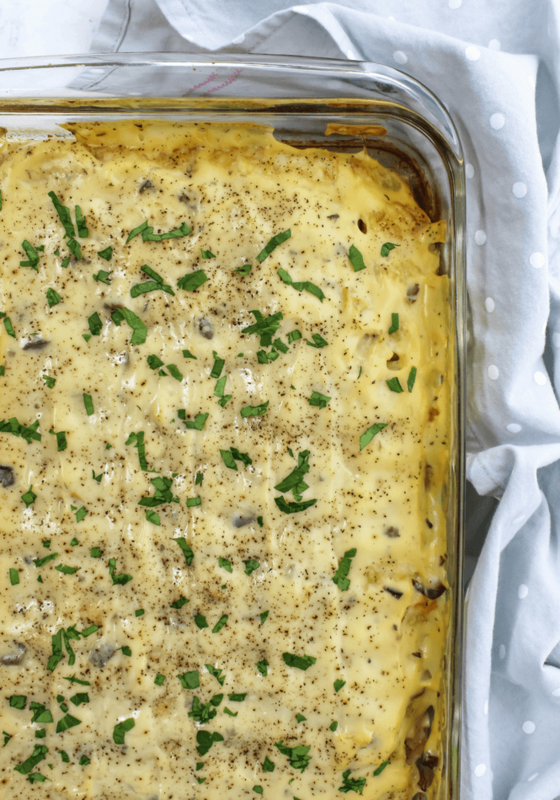 As the deli meat warms up in the oven, place the Ricos Premium Cheddar Cheese Sauce in a saucepan on a low-medium heat on the stovetop. 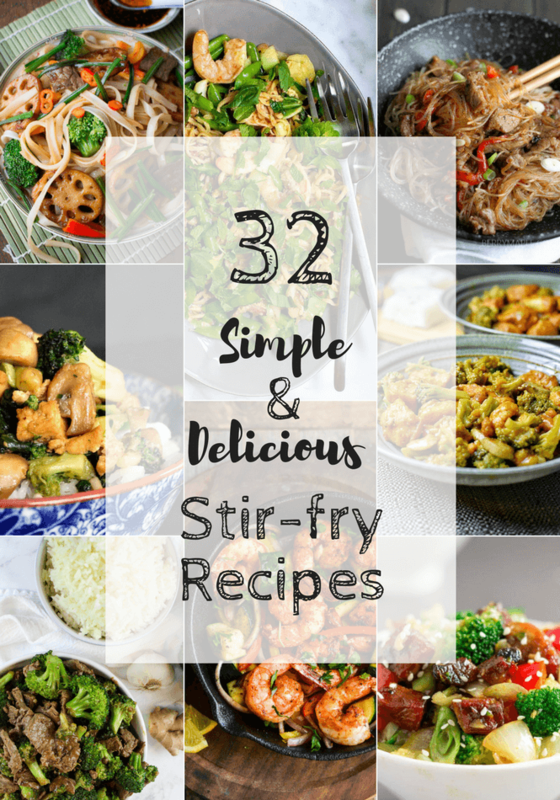 Stir frequently for 10 minutes. Assemble the sandwiches. 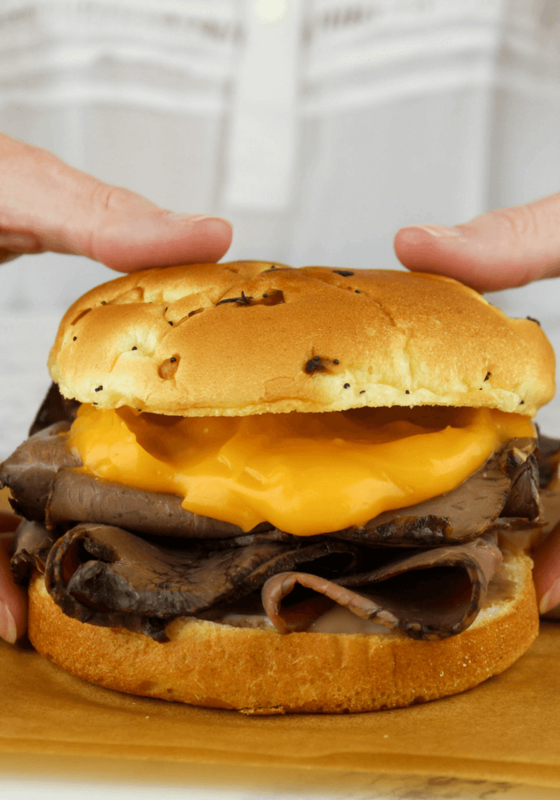 Place a teaspoon of horseradish on each bottom hamburger bun, followed by four slices roast beef deli meat, then a dollop of the Ricos Premium Cheddar Cheese Sauce. 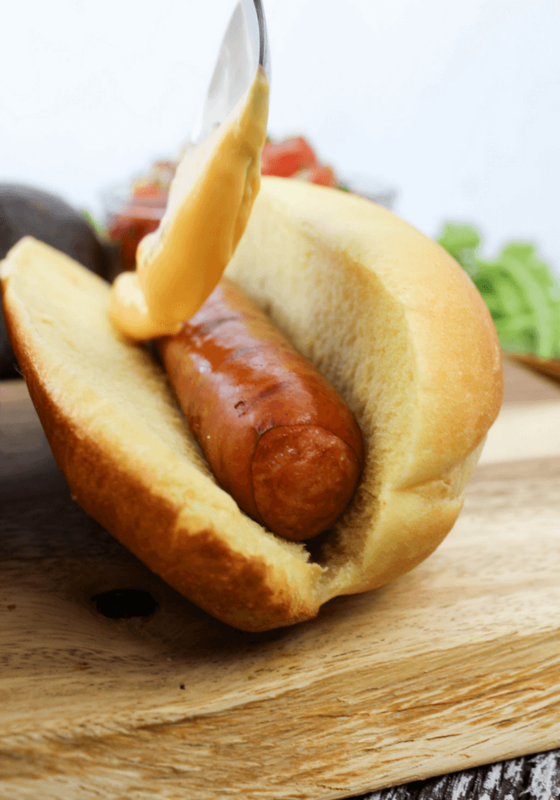 Complete with the top of the hamburger bun and serve. 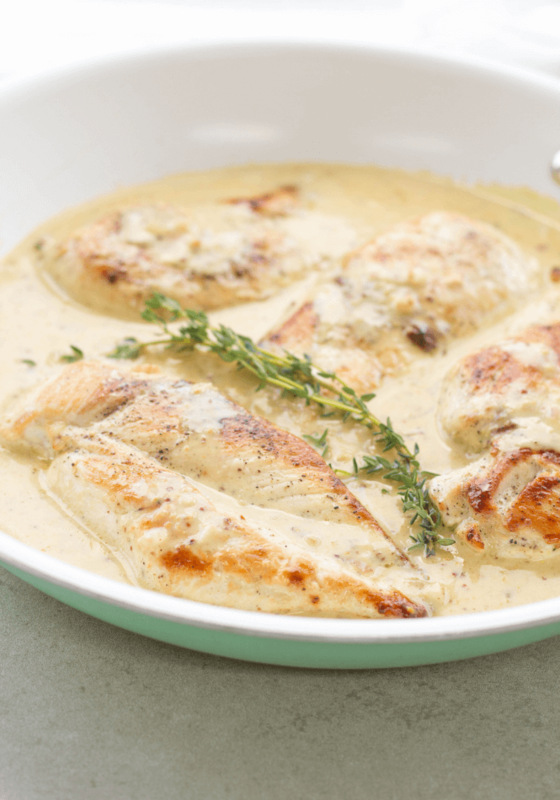 What are your favorite recipes for Ricos Cheese Sauces? Let me know in the comments below!